Google has announced new Apigee capabilities to provide organizations with more control and visibility into their APIs. According to Google, the new capabilities will enable organizations to deliver connected experiences, create operational efficiencies, and unlock data. The company announced a new partnership with Informatica, a integration-platform-as-a-service provider, to bring new capabilities such as the ability to discover and invoke business integration processes with Apigee, access Google Cloud services from the Apigee Edge user interface, and publish business integration processes as managed APIs. “APIs are an increasingly central part of organizations’ digital strategy. By working with Informatica, we hope to make APIs even more powerful and pervasive. Click here for more on our partnership with Informatica,” wrote Ed Anuff, director of product and strategy, Apigee in a post. Developers will be able to discover and invoke processes defined in Informatica’s Integration Cloud by using policies, Google explained. They will be able to add a callout policy in an API proxy that will invoke the required Informatica integration process. According to Google, this is useful in instances where the business integration process needs to be invoked before the request is routed to the backend target. 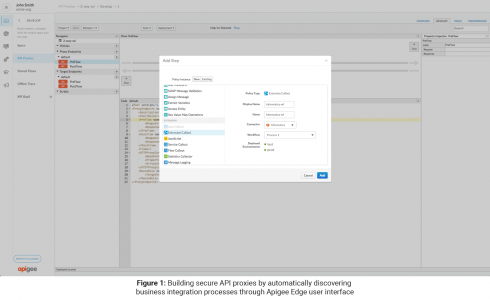 Apigee Edge now has a feature that simplifies interacting with Google Cloud services and allows connectivity to them through a policy interface selected from the policy palette. Once it is configured, they can be reused across any API proxy. Finally, integration architects using Informatica’s Integration Cloud for Apigee will be able to create composite services using business integration processes to orchestrate data services and applications. They will then be able to directly publish them as managed APIs to Apigee Edge. Previous articleunit tests – What kind of Software testing(Black-box or White-box) is done by django testcase classes?